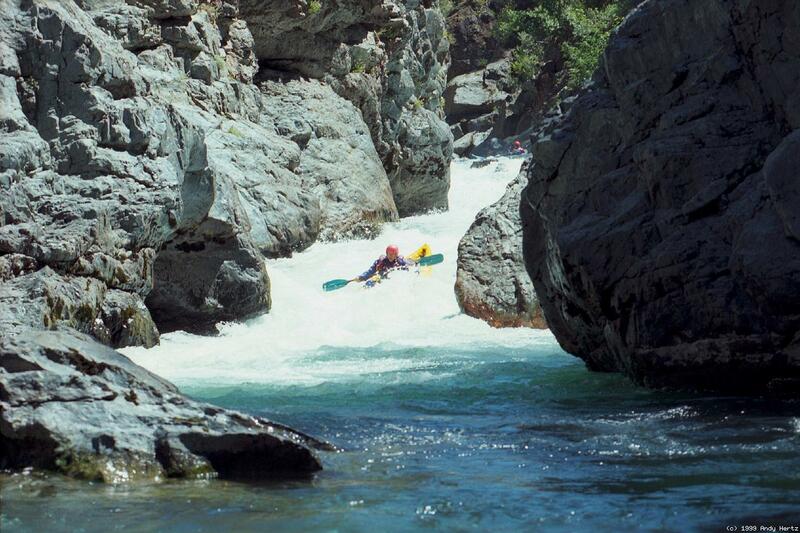 Giant Gap is a total classic, both for its whitewater, which is intense at times and relaxing at other times, and for its dramatic canyon scenery. The view of Giant Gap from your trailhead is awe inspiring, and once you boat into the Gap, there is no exit except by river. 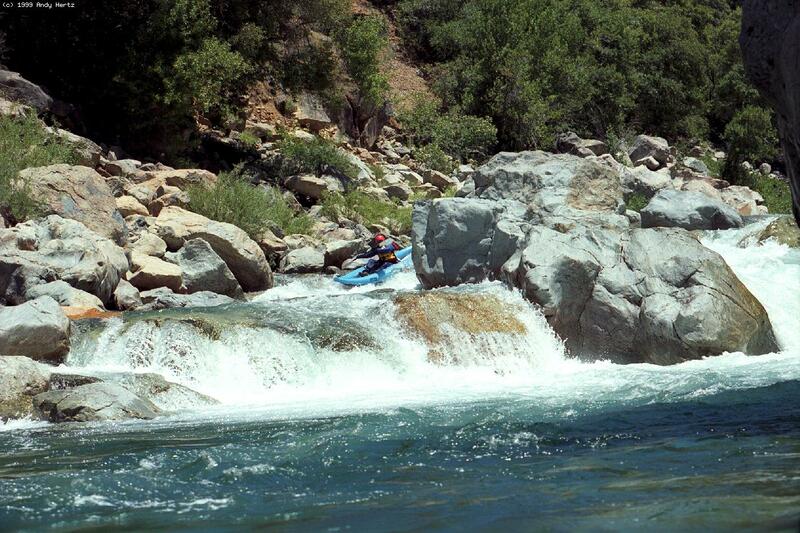 Below 600 cfs this is more of a class IV run than a class V run, although two or three rapids remain class V even at low water. Many class IV rapids require bank scouting to pick a good route, unless you are familiar with the best routes, but even then the rapids often change from year to year. There is a pleasant campsite on a wide boulder bar about a third of the way down the run, but camping gear makes the hike down to put-in much tougher. Most people do this run in one long day, finishing just before dark or shortly thereafter. Camping at the trailhead and starting your hike down before dawn is an excellent precaution against finishing in the dark. This run is not exceptionally hazardous. There are probably fewer deathtraps per mile on this stretch than on the Chamberlain Falls section just downstream. 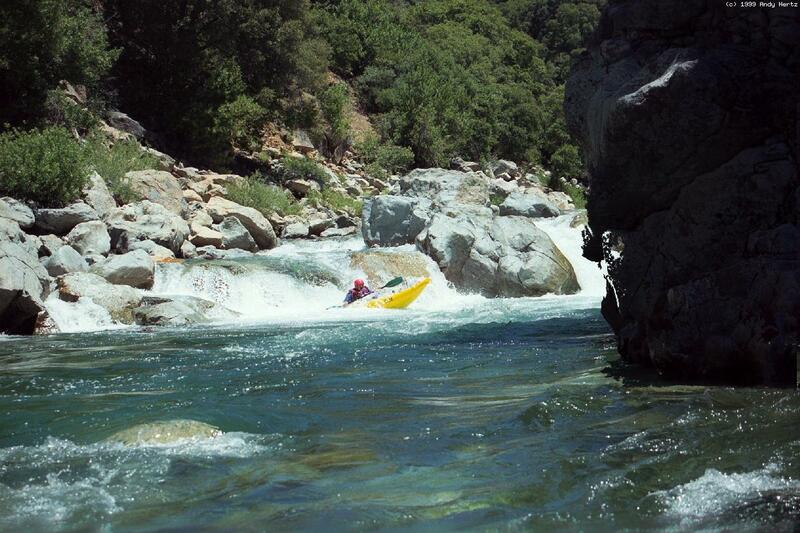 In 1985 hardshell kayaker Mark Allen died on this run, but it was in the easier class II-III section after the Gap, from broaching on a rock without any nearby companions to rescue him. Put in at the limpid green pool below the Euchre Bar pack bridge. Class III rapids begin immediately, and continue into a small gorge where the river has cut a narrow channel. 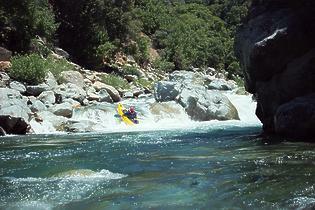 Frequent waterfalls provide a scenic backdrop, but the rapids are too continuous for you to pay much attention. 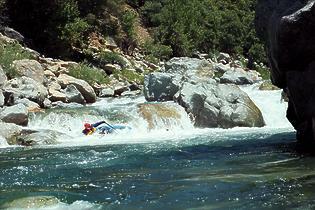 The canyon opens into Green Valley and the rapids taper off to class II. Several hiking trails reach the right bank here, including one from your trailhead, but the trails are difficult to spot from river level. Giant Gap begins, marked by a rapid where most of the current piles into a huge midstream boulder, often with a tree stuck there to make things more exciting. Rafters should scout right because the widest channel is over there. 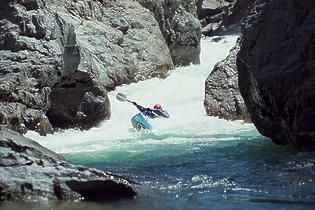 Kayakers can often negotiate the narrow passages among boulders towards the center, where the drops are less steep and turbulent. The river drops over a rock fence and into a narrow turbulent chute flanked by a big boulder on the left and a cliff on the right. Not as technically difficult as it looks. Easy portage on the left. One boat in the Nutcracker, one boat above Good brace/lean to prevent tipping! The entire river drops over a 5' or 6' falls into a reversal that can be very sticky. 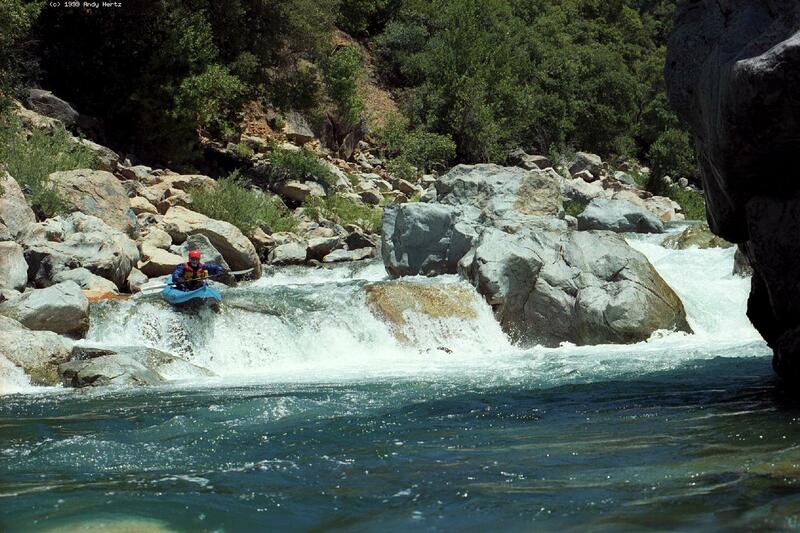 At low flows you can wade over an underwater gravel bar to get a look at the falls, and even line your boat over the falls from a rock on the right. 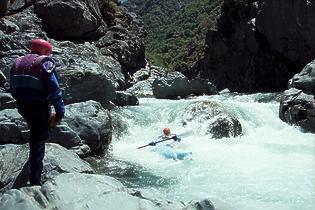 At higher flows this rapid is extremely difficult to scout and almost impossible to portage. Large gravel bar on river right makes a good camp or lunch stop. 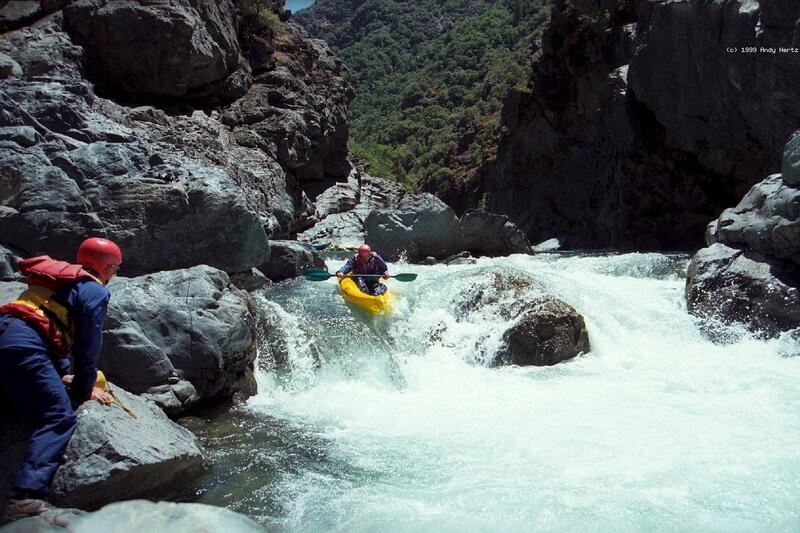 Many entry routes, not the same ones at all flows, make this rapid difficult to anticipate. All routes lead to a huge drop at the end, which is cleanest on the far right, but has been run, sometimes unintentionally, to the left of the final plug rock. 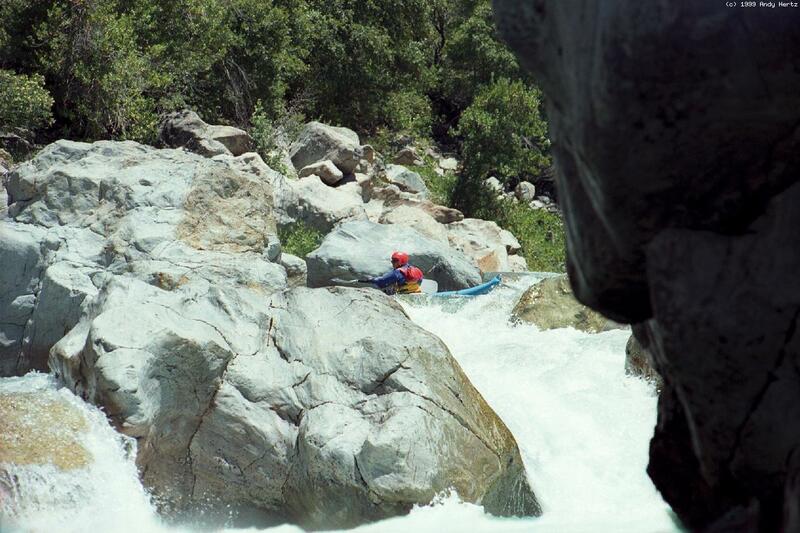 Moderate portage over boulders on the right bank. Mumu shows that it's easy to get surfed off-course in this rapid. 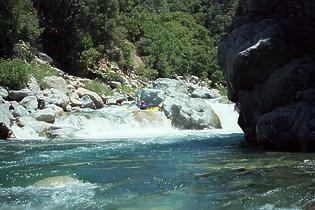 Canyon Creek enters thru a narrow cleft on the right, after dropping over several scenic waterfalls just upstream. Pickering Bar on the left bank. A trail leads out of the canyon from the right bank. 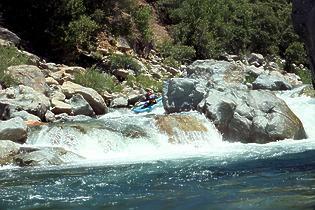 Shortly below, the rapids taper off from class IV to mostly class III. Tommy Cain Ravine on the right, with a trail leading out of the canyon. A long slalom over major drops with curling waves that can easily flip a kayak. The rapid is difficult enough, and comes at the end of the trip when you are tired and not ready to concentrate. There are several mandatory left-right-left moves. Take out on the left bank at the USFS campground above the Iowa Hill road bridge. To reach take-out, exit I-80 at the Colfax exit. On the south side of the freeway, follow Canyon Way west for about a quarter mile. Turn left onto Iowa Hill Road, and descend to the river. The USFS campground is on the far side of the bridge. To reach put-in from there, return to I-80 and drive uphill to the Alta exit. On the south side of the freeway, follow signs towards Casa Loma. After one mile turn right at a sign for Eucre Bar Trail. This road crosses the railroad tracks after .5 mile, and again after another .8 mile, changing to dirt now and again. Be careful, this is an active railroad line. After another .6 mile the dirt road forks. Take the left fork, which leads to the Euchre Bar trailhead and outhouses. To find nearby food and lodging, type Colfax into the box and click Search.